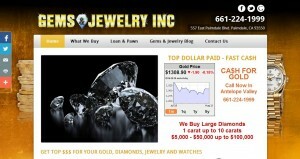 Gems & Jewelry Inc address, phone, website, hours of operation, and more. 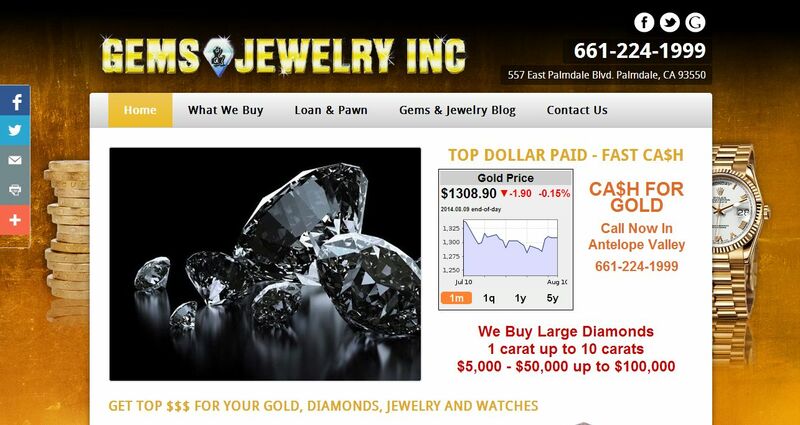 Thinking of selling your gold, diamonds, jewelry or watches? You need to find a buyer you can trust. Gems & Jewelry Inc. is that trustworthy buyer you’ve been waiting for! We are a reputable company that holds itself to high standards in the buying and selling process. We take every client seriously and we guarantee that you will have a safe and secure selling experience. Bring in whatever precious metal items or scraps you have, regardless of quality or condition, and we will give you the highest cash offer in Antelope Valley! We consistently pay top dollar for your gold, silver, gems, and even Rolex watches. Act now and help get the extra cash you need for a down payment on a new home or car, the vacation of your dreams, or whatever else you might need or want.